Donna Alvermann is the UGA-appointed Research Professor of Language & Literacy Education; she also holds the Omer C. Aderhold endowed professorship. 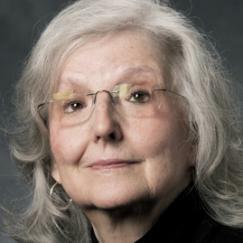 Her research focuses on adolescents' digital literacy practices in and out of school. Considering that Simone de Beauvoir and I were separated by two generations and two continents—to say nothing of the social, familial, disciplinary, and linguistic disconnects between us—it is little wonder that I marveled to myself when her name came instantly to mind as a result of reading Renee Hobbs’s invitation to choose a metaphorical grandparent for my field of study. The next thought that crossed my mind was how could I have read, at length and deeply, de Beauvoir’s literary novels, feminist and philosophical treatises, and multivolume autobiography, supplemented by numerous secondary sources—I even visited her grave in Montparnasse and later imagined myself writing at a table on the second floor of Café de Flore—and yet never once have cited her in any of my research on digital-media literacy? In acknowledging deBeauvoir's influence on my life, I have rethought some of my own work on how youth who self-identified as nonreaders in school exhibited complex literate practices while engaging autonomously with digital media in informal learning contexts. Participating as literate beings in out-of-school venues during after-school hours arguably freed these students from being Othered by school curricula and well-meaning educators bent on liberating so-called nonreaders from what was perceived as a lifetime of narrowed opportunities. In looking back at my own work, I had published data from research studies funded by the Spencer Foundation (Alvermann 2006) and later by the Bowne Foundation (Alvermann et al. 2012) that challenged the legitimacy of schools’ labeling practices that marked adolescent (and mostly male) struggling readers as likely to become high-school dropouts and thus candidates for whatever the then-in-vogue remedial program might offer. When the young men and women in those two studies were in less-formal learning spaces—in a community-supported After School Media Club at a local public library with free access to the Web, and in a Saturday academic-support program designed to teach critical media literacy skills using student-selected online resources—they were self-actualized literacy users. In retrospect, had I interpreted the findings from these two studies using de Beauvoir’s existential lens, I would surely have credited her for reminding me that throughout history, attempts to liberate Others by means that ignore individual will and choice are likely to produce new tyrannies that are arguably worse than becoming so-called nonreaders. Despite finding de Beauvoir’s writing on existential liberation compelling, I am aware of its limitations, especially when applied in educational settings. 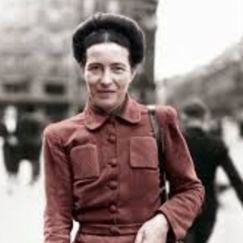 Case in point: while writing The Blood of Others, which was published in 1948, de Beauvoir is said to have worked out “her intention to express the paradox of freedom experienced by an individual and the ways in which others, perceived by the individual as objects, were affected by [that individual’s] actions and decisions” (Bair 1990, 305). The Blood of Others, a fictionalized account of de Beauvoir’s personal experiences in Paris during World War II, explores her commitment to the existentialist concept of individual freedom. When the book appeared in the United States a year after her four-month sojourn in this country, it was lauded as being a fictional primer on essentialism, and de Beauvoir was considered an author who represented “the most Existential of all the Existentialists” (Bair 1990, 306). Yet a stateside critical reviewer, Richard McLaughlin, writing for the Saturday Review of Literature, claimed serious doubts about “the ultimate achievement of [a state of pure individual freedom], since if the existentialists insist on total responsibility they also urge total involvement” (1948, 13). Following this line of reasoning in regard to total involvement, McLaughlin argued, would make it virtually impossible to remain untouched by the resolve of others; in fact, attempting to do so would deny a basic existentialist tenet—namely, that other people possess the same desire for total responsibility for their decisions and actions. This paradox, of course, has implications for schools, communities, and society at large.